It finally feels like Christmas! It’s snowing for the first time in December in two years. Even as an adult, I’m pretty excited. I’m hoping we have a white christmas. We’ve also already hosted our first two christmas get togethers, and I’ve had my work staff party. As a teacher, it’s pretty exciting to have an entire class of students watching out the window as the snowflakes begin to fall. Needless to say, we’re not getting a whole lot accomplished in these last two weeks of school. Another reason it’s beginning to feel like christmas is that I’ve almost finished all my baking. I parked myself in the kitchen last weekend and cranked out what can only be described as an overload of sugar. My husband’s friend always ask how he is so thin with the amount of baking I do, but he always tells them that he’s not allowed to eat it. Which is true – I always tell him he’s not allowed to touch it until It’s out for guests, then he can finally have some. He’s so deprived. 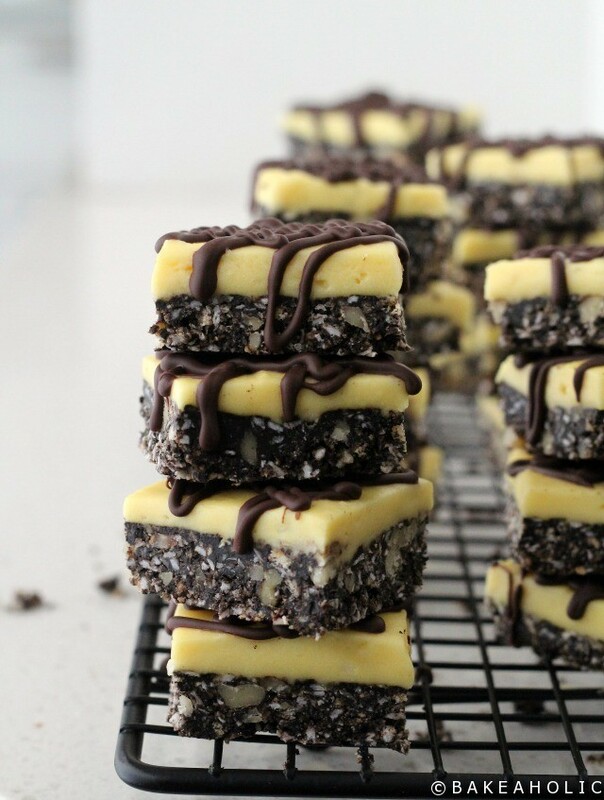 I knew I had to make the classic christmas treats – and that included nanaimo bars. My grandma always made them as a kid, and then my aunt took over making them. She was the nanaimo bar queen. I asked her for her recipe before, and I try and make them as good as she does. This year however, I decided to try something a little different. After doing some investigating, Graham Crackers are actually vegan. They contain no egg or butter. 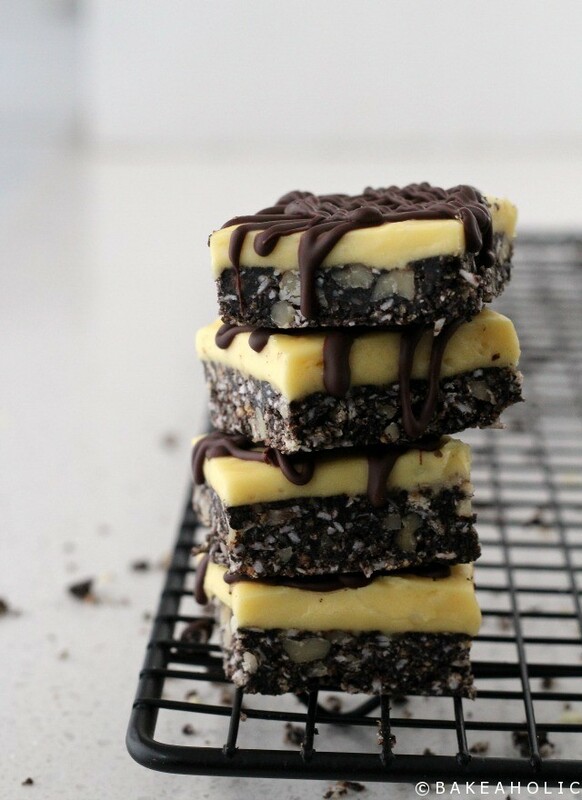 So I thought why not try and make vegan nanaimo bars! I subbed the butter for coconut oil – which works perfectly as this is essentially a coconut dessert. And then I used a flax egg – which I wasn’t sure about, but it turned out great as well! You can of course make the original, subbing butter and eggs, but I can honestly say these are AS good, if not Better – than the original. 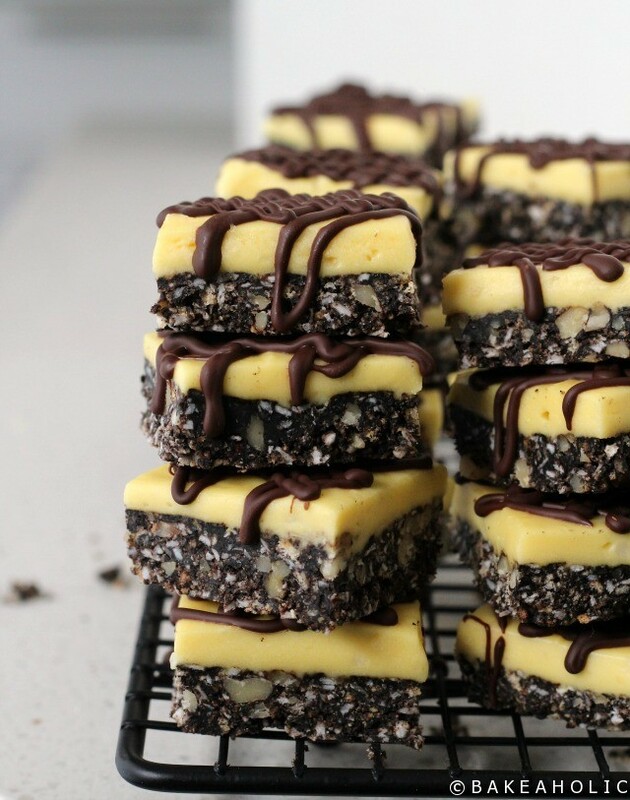 These Nanaimo Bars are just as delicious as the original version, but made slightly healthier with coconut oil and flax seed eggs. In the top of a double boiler (if you do not own one, place a glass or metal bowl over top of a sauce pan filled with simmering water) melt together the coconut oil. Add in sugar and cocoa, whisk to combine. Remove from heat when fully melted. In a small bowl make the flax egg. Slowly whisk it into the melted butter and cocoa mixture. Continue to whisk until it thickens. Remove from heat and stir in the crumbs, coconut and chopped walnuts. Press mixture into a parchment lined 9"x13" pan and place in fridge, covered. In a stand mixer with paddle attachment whip the coconut oil until pale and creamy. Add the almond milk and custard powder and continue to beat. Slowly add the icing sugar and whip until the consistency of frosting. Take the chilled base out of the fridge. Spoon the custard layer over top, using a offset spatula or spatula to smooth evenly over top of bottom layer. Place in fridge, covered to set 3-4 hours, or overnight. You want the base to set and harden completely. Once chilled, remove from fridge. Carefully lift out of the pan using the parchment paper. Using a long knife, cut evenly into 1.5 x 1.5 inch bars. Finally, after you have sliced the bars fully into squares place them onto a cooling rack with a piece of parchment paper underneath. Melt the Chocolate and coconut oil in the microwave in 1 minutes intervals, stirring until fully melted. Spoon the melted chocolate into a ziplock bag or piping bag and snip off the corner. Drizzle the melted chocolate over top of the bars. Place aside to allow chocolate to set. To store the bars, place them in an airtight container in the fridge separating the layers with parchment. Alternatively, you can place them back into the 9x13" pan and cover. The bars also freeze very well.